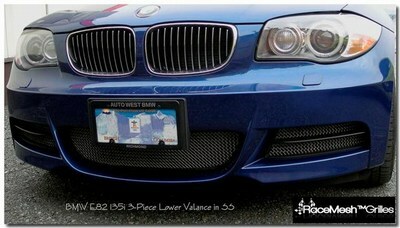 Lazer Precision Cut Valance Grilles add a One of a Kind Look to your 1-Series!!! Get rid of your E82 stock, boring Valance and replace it with an aggressive RaceMesh valance grille. RaceMesh Grilles are laser cut, making fitment for your 1-series PERFECT. RaceMesh Grilles and valances are a breeze to install and can be done in under 10 minutes. All RaceMesh grilles are precision crafted from stainless steel, and will not rust or corrode. Upgrade the appearance of your 128i/135i with RaceMesh valance grilles. RaceMesh grilles are custom made to fit your car perfectly, so there is a 4-5 week lead time. Once the order has been placed, the order may not be cancelled.